So now that you have your brushes cleaned, it's time to get them set aside to dry and be safe until the next time you are going to use them. 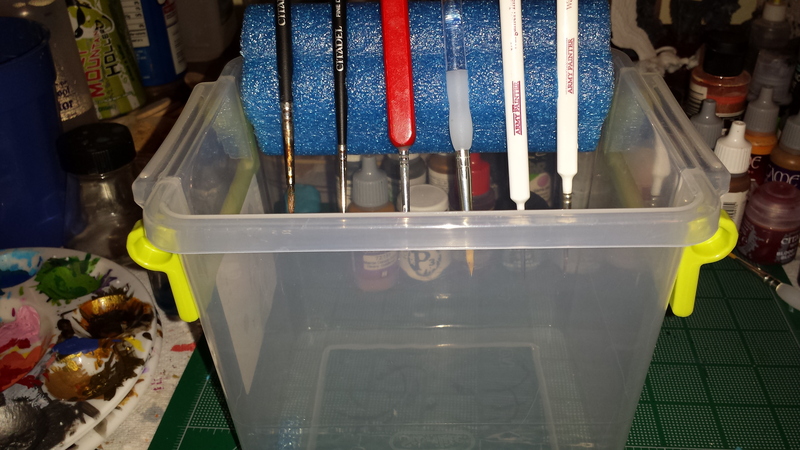 Now, there are several ways you can do this, and again there are many conflicting thoughts on how to store your brushes, but one thing almost everyone agrees on is that you do not want to store them flat on their sides on a regular surface. Now, the old school thought is that you will need to store them with the fibers pointed up. There are several commercially available storage units that let you do this, or you can just put them in a jar or cup with the points up. This is a tried and true method, and extremely cost effective in terms of getting the hardware to accomplish the desired result. Personally, I do not like this method. When you store the brushes after cleaning or even just use, there is still moisture in the bristles. 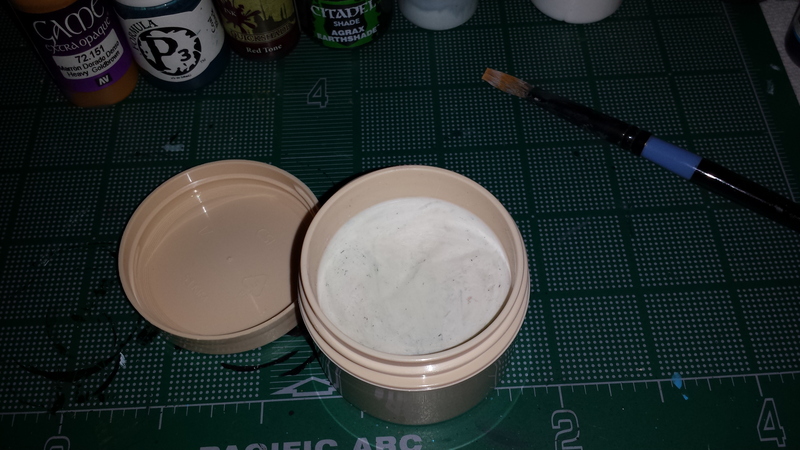 As they sit, if they are point up, that moisture tends to settle into the ferrule. 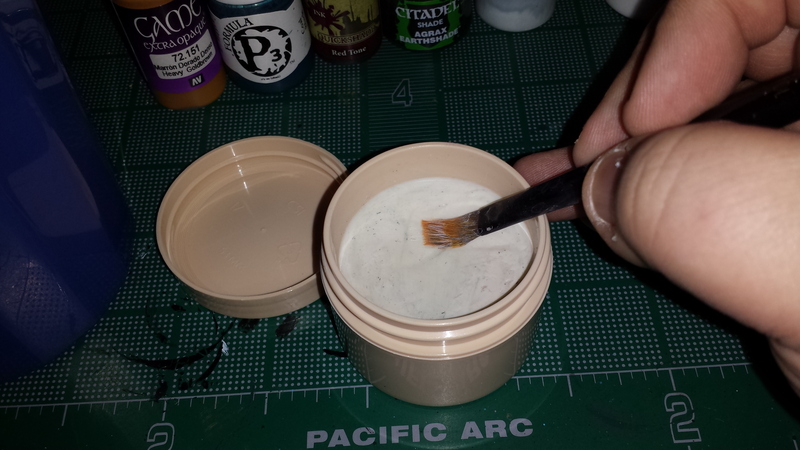 Now, the hairs on the brush are adhered to the handle usually with some form of adhesive. 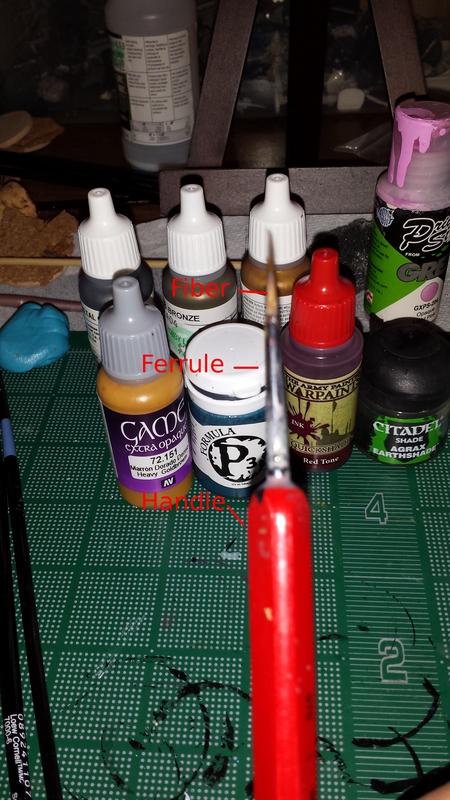 Over time, as moisture keeps gathering in the ferrule, that bond can break down, causing your brush to have a hard time maintaining shape and point, or flat out losing fibers, no matter how well you clean them. 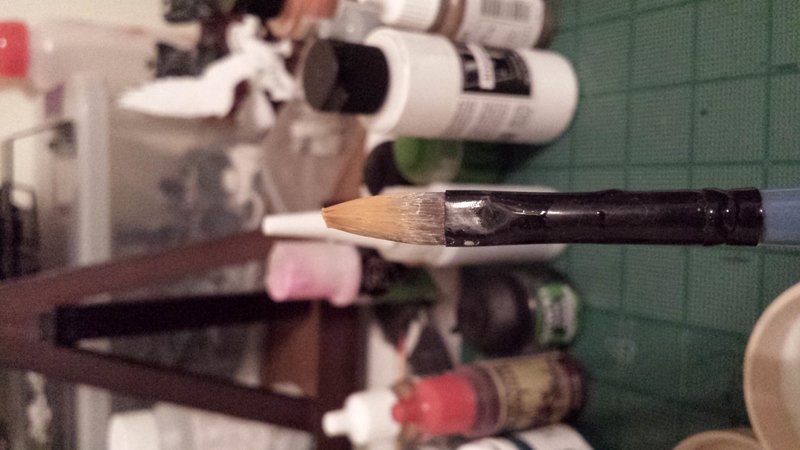 I've found this to be particularly true of "gamer" brushes over the years, and I've had this happen with the old Citadel Brushes, Army Painter brushes and several others. That's not to say that they are bad products, but rather they just require a little additional care and consideration. 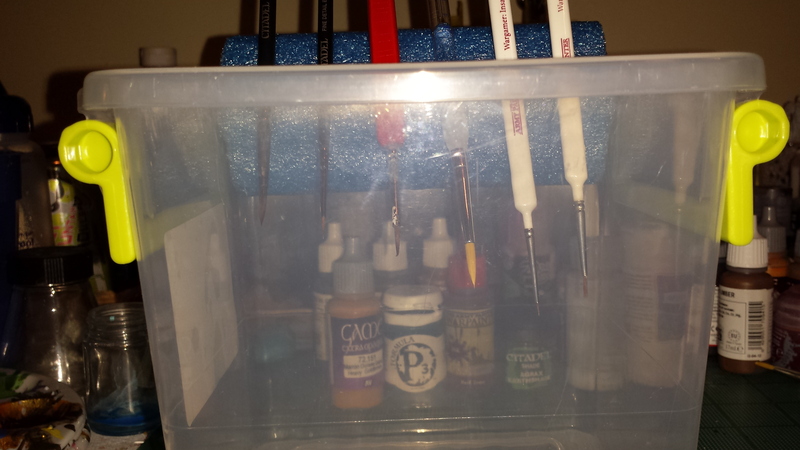 I am now of the mind set of storing your brushes point down. This allows for gravity to do it's thing and draw the moisture away from the ferrule, and just overall improving the health of your brushes. 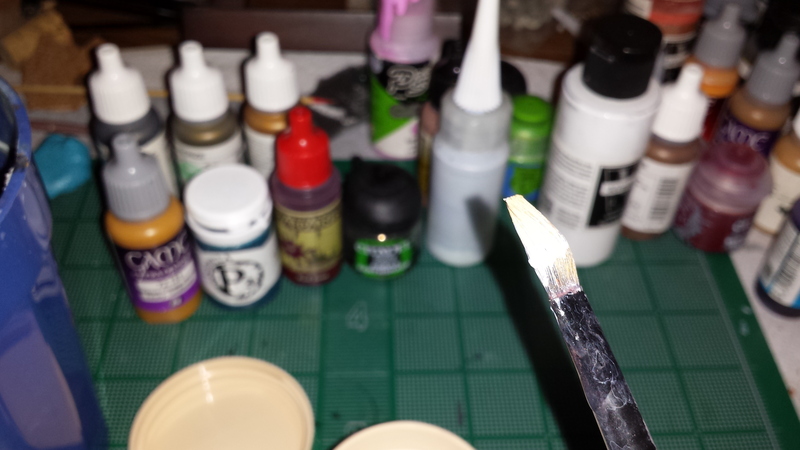 Now, storing them point down can be tricky, since you don't want to rest them on the actual fibers and cause additional stress or warping of the brush. 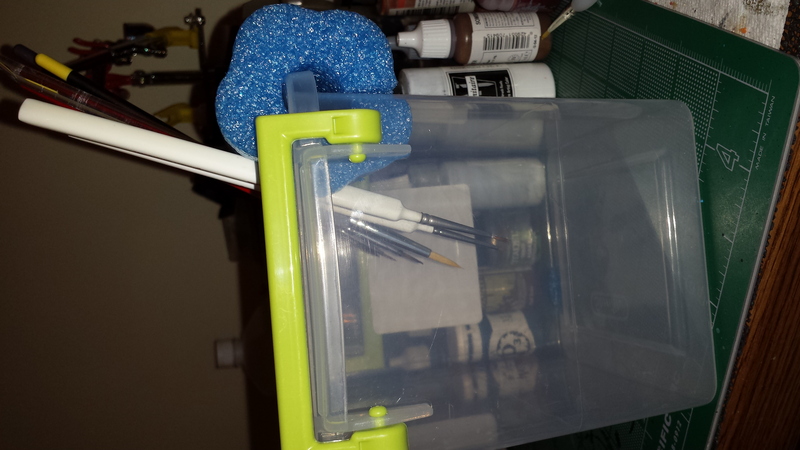 There are several commercial solutions available, brush stands that allow you to store the brushes point down and let them dry and rest until your next use. Traditionally they have some form of spring or grabbing system suspended over a pot or cup to collect the falling moisture. 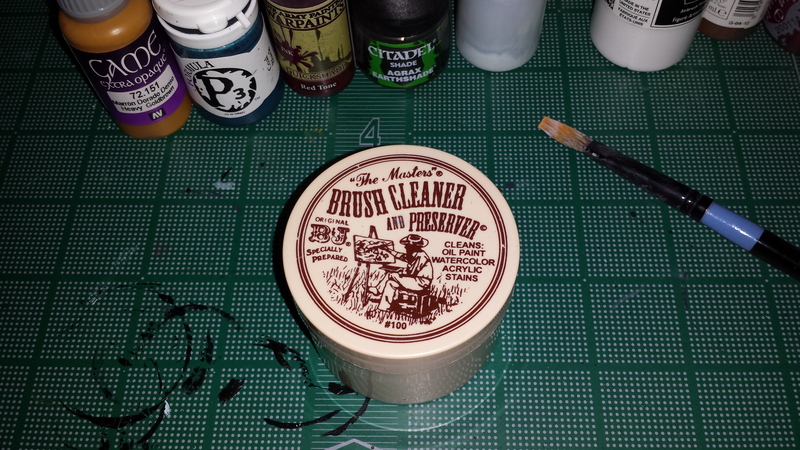 Some brush cleaning kits even come with one. You can purchase them at local craft or art supply stores and they can run you anywhere from $10USD to upwards of $100 USD, depending on what materials they are made out of. They do the job very well, and are worth the money if you plan on using this method. There is however another more cost effective way to achieve the same result with a simple little home hack for storage. 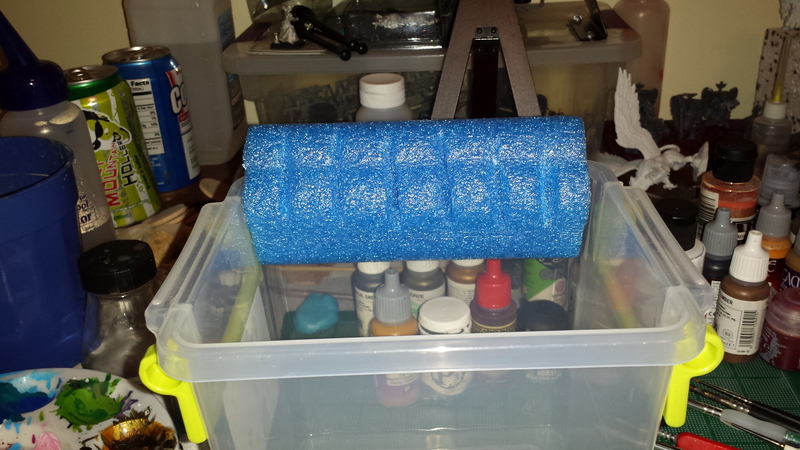 Now, it requires a little work to assemble but will give great results, what you will need is a tupperware storage container that is taller than an inch, and a foam pool noodle and a hobby knife. Sounds goofy, I know, but bear with me. Cut the foam noodle so that it will fit over one of the sides of the tupperware container and then cut it length-wise down one side. The foam noodles usually have a hollow center, so you'll want to cut all the way to it. If it doesn't, just make an approximate guess of about halfway through. Slide that over the side of the container. Next, make small incisions on the side of the noodle that faces the inside of the container. You don't have to carve out sections, just make some small shallow cuts. 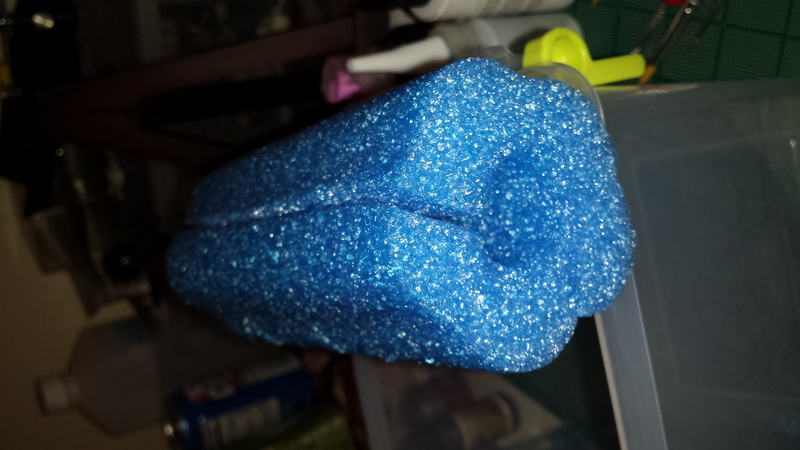 When you're done, you can push your brush handles into the cuts you have made, and the pool noodle will grip them and keep them suspended over the container so the bristles don't touch the bottom. If you find that the noodle isn't holding them quite as tight as you would like, you can also use a small bit of bluetac or poster tac on the handles to help the foam grip it. 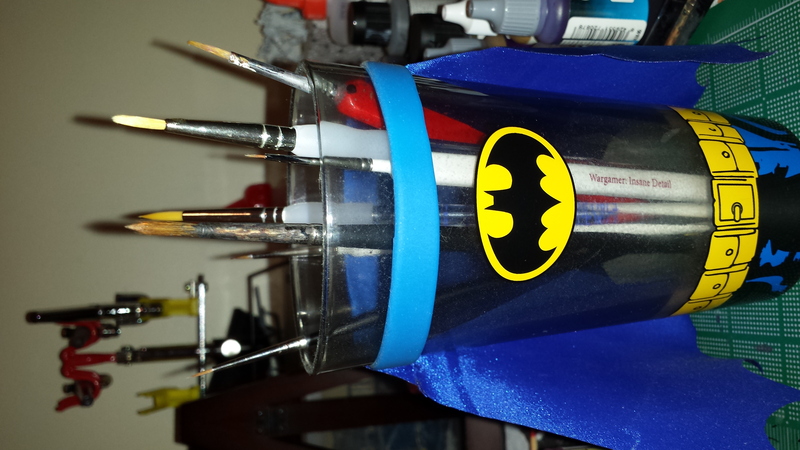 This build also has the additional bonus of protecting the brush tips from incidental collision if you have to move them around your desk. 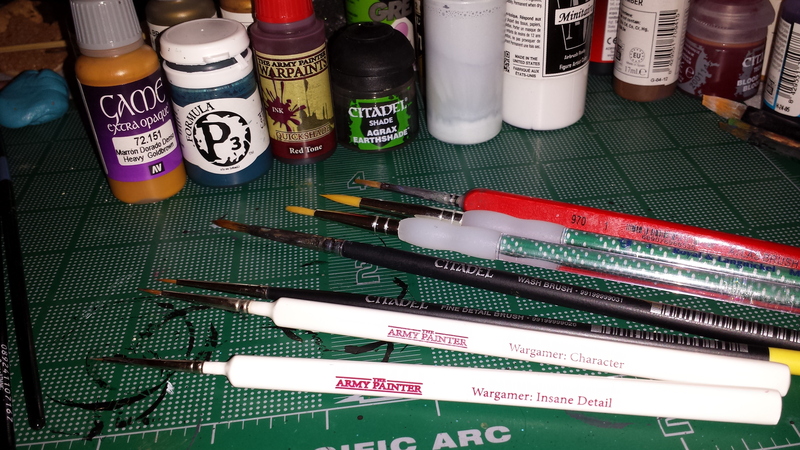 I personally like this build because I have a lot of brushes with very oddly shapped handles that commercial stands do not accommodate, and it lets me customize to suit my brush needs. The entire project can be built for under $3 USD and the materials can be found at dollar stores or discount sections of your local mega mart. With a little extra care, and a little extra knowledge, you can not only pick the brushes that are right for you, but keep them working for you for a long time. 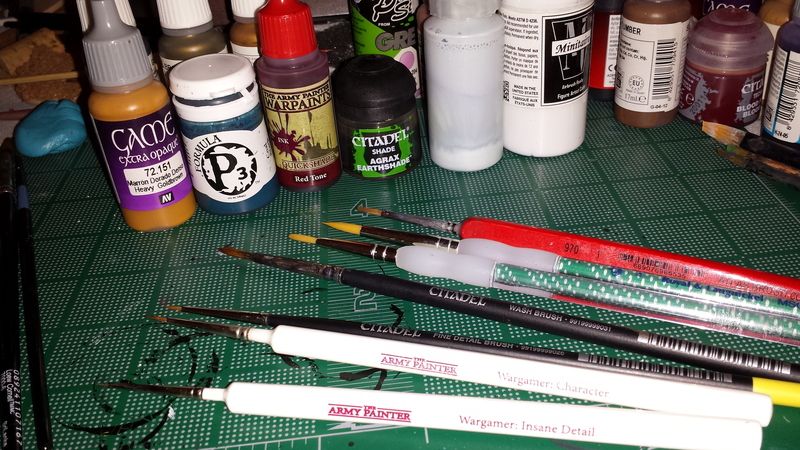 With all the money we spend on our miniatures, getting that return on investment for all the items involved in our hobby makes sure we can spend more time painting and playing than just replacing worn out tools.